The Invisibles are a pleasant mix of Rock and Jazz and even a little Blues. They tend to have a rather unconventional sound in regards to their Rock music, explaining their “Experimental” tag. 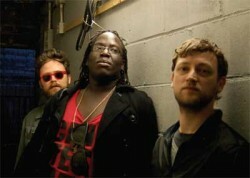 The music they make is very Jazzy which comes from Dave Okumu’s longtime affiliation with London Jazz. Dave has the perfect voice for the Jazz/Rock music the band makes. If Jazz is your thing, then MarsBands.com suggests you check out The Invisible.